Andaman Discoveries Blog: Wild Asia Assessment – Two Years in a Row! Wild Asia Assessment – Two Years in a Row! 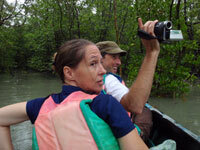 Rebecca and Peter of Wild Asia on a mangrove tour. Andaman Discoveries has again been short-listed for Wild Asia’s responsible travel awards. This annual award was created to identify, share, and inspire best practices in tourism to encourage responsible operators and to promote the evolution of sustainable destinations in Asia. This month we were honored to host Rebecca Thomason and photographer Peter Walker for several days in Ban Talae Nok.